Will My Kid Grow Up To Be Like That? – Hi Blog! I'm Dad. Will My Kid Grow Up To Be Like That? Every now and then, someone will post a video on social media about a father and his non-verbal son. In nearly every case, the son will be somewhere north of his teenage years and I’ll watch as he interacts with his dad. Everyone leaves comments with heart emojis about the beauty of what they just saw. Will my son grow up to be like that? Lucas is six and, as of today, non-verbal. While he’s going into first grade, to me, he’s still my baby and always will be. I feel the same way about his sister, who is nine and not on the Autism spectrum. The fact that he doesn’t speak is just the way it is now and has been since he first arrived. I don’t see it as a blessing or a curse. I just see it as reality – the reality of the moment. The reality of the future, however, is a very different thing and could literally be anything. I learned to accept that early on. It wasn’t something that I easily accepted. Rather it was a truth that I had to accept out of necessity. 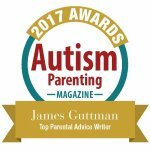 In the early days, no one will give you any definite answers when it comes to a child with Autism or any special needs. You want to rip your hair out and tear the medical degrees from the walls, but still you can do nothing but stare into the sympathetic eyes of doctor who tells you, “Anything can happen.” With a shrug, you head home to obsessively dissect all the possible scenarios that “anything” might include. So, truth be told, when I see a video of a man similar to Lucas, I have to take a moment to adjust. I immediately place myself into the position of the father and wonder how I would be in that situation. I mean, that’s completely different than who he is now. Then I remember back to those days when I was begging professionals for a straight answer regarding my son’s future. Just two at the time, I couldn’t picture how things could be once we were out of the toddler years. What could life possibly be like when he’s no longer baby age and on his way to being a genuine kid? You know, like a six year old. Kinda like he is right now. What’s it like? The answer is a common one I’ve given about our situation. It’s fine. He’s fine. We know him. He knows us. We’re a family and we love each other. Any successes or failures he has, we share, just as we do for the rest of us. Whether or not he speaks or has Autism is just a facet of his personality. If anything changes, we’ll be there when it does. If it doesn’t, we will be there for that too. Wherever he goes, we’ll be with him. That’s all that matters. Everything after that is incidental. The truth is that our kids grow in front of our eyes. I often tell my wife that it’s going to be weird if I become an elderly man snapping pictures of two middle aged people who I think are adorable, but I have a feeling that’s where I’m heading with these kids. The steady flow of who they are moves forward and we all experience it together. Age two rolls into six which rolls into teens which rolls straight into adulthood. Your head is spinning the whole time and every few months, you look back at old pictures on your computer and shake your head. Kids aren’t affected the same way. A year or so ago, I came across a baby picture of my daughter. I scrunched up my face in an exaggerated frown and called her to the computer screen. Olivia! Look. Look at that baby. What happened to her? She looked me coldly in the eyes and, with a voice pulled straight from The Exorcist movies, exclaimed. She then broke out in hysterics. To this day, we still joke about it. Well, she jokes about it. I laugh along on the outside. And cry on the inside. That’s the other aspect of all this that has helped me in my life as a whole. It’s the understanding that it’s not just my son’s future is that I can’t predict. It’s anyone’s future. I have no idea what my daughter will grow up to be. I don’t stay up at night worrying about it. She’ll do what she does and I’ll try to make sure I steer her in the right directions. That’s all I can do. The decisions she makes in her life will be her own and I will love her no matter what. While the image of who she becomes in twenty years would be shocking to see out of context now, the fact of that matter is that we’ll eventually get to that point together. By the time we do, it’ll be the reality of the moment. It won’t be shocking or confusing. It will be the way it is. The same holds true for her brother. Parents of children with special needs have the same situation. We struggle with major worries about scenarios that haven’t played out yet and the feelings we assume we will have when they do. Rarely, if ever, are things ever as “bad” as we imagine. A few years ago, I would have thought that Lucas being non-verbal at six was the end of the world. Now, he’s non-verbal at six and he’s one of the brightest lights in my world. I love him for who he is and I’ve loved him as he’s grown into the person who he is today. Why should who he becomes tomorrow be any different?